For the work in the vineyard we propose several possibilities of tool assemblies which will adapt to your agricultural equipment. 2 or 4 tools fixed on the frame of a straddle. With the aim of allowing you a simplified, fast and effective maintenance under the row, we propose you brushes for the mechanical weeding. 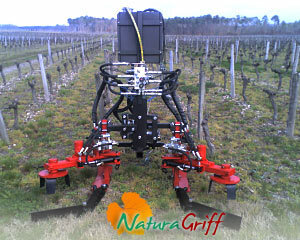 This tool, by its flexibility, adapts itself to all the types of ground, any configuration of vine, and thus assures you a big versatility. Associated with an ease of handling and use, the wire brush will reassure you during your passages and will make for you save time. Our working methodology consists in preparing grounds before winter then in using brushes in maintenance under the row early in the season. This method will allow you to work on a speed of 5kph progress, thus to save of fuel and of time. The absence of risk of breakage allows you a more reassuring and less binding work. The brushes of mechanical weeding NaturaGriff can be coupled either been thought of as a supplement to other tools as the work of the ground, the mechanical weeding or the edger. There exist various NaturaGriff-tools for the soil preparation work, the mechanical weeding or the cutting of edges.